The Tidy Street parents are on the warpath. 'Leave this street,' they say to Quin Majik. 'Immediately.' Of course Quin isn't going anywhere. Instead he and Fred Smart hatch a scheme with stilts, codes and cunning to liberate the Tidy Street kids from The Rules and let them have s... read full description below. The Tidy Street parents are on the warpath. 'Leave this street,' they say to Quin Majik. 'Immediately.' Of course Quin isn't going anywhere. Instead he and Fred Smart hatch a scheme with stilts, codes and cunning to liberate the Tidy Street kids from The Rules and let them have some fun. 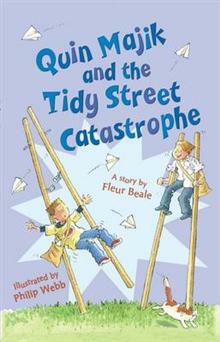 Another hilarious tale about the inventive Quin Majik, maverick of Tidy Street. Fleur Beale is a well-respected and widely-published author of children's books. Her work has also been published in Singapore and America and she is the recipient of several literary awards. She participates in the Writers in Schools programme and takes workshops for young writers. Fleur was born in Inglewood and, after graduating from Victoria University, she became an English teacher. She has travelled and worked overseas but now lives and writes from her home in Wellington.